The location: The Fishing Fleet. A. A fleet of fishing boats at a dock. A. The location isn't mentioned. A. In Episode 5 (of the third season) "The Perfect Storm". Ryan (and Marissa) have been kicked out of the Harbor School for the Trey shooting incident, and Ryan has made things worse by punching out the obnoxious Dean at the school carnival. Assuming that he has no chance of going to college, Ryan begins looking for a job. 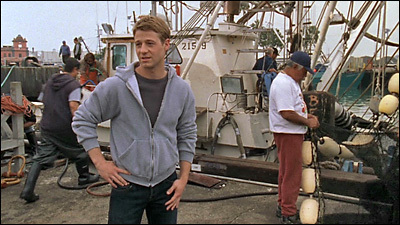 Johnny tells him that his uncle might need help on his fishing boat, so Ryan goes down to the docks and asks for a job, and that's when we see the fishing boats at the dock. 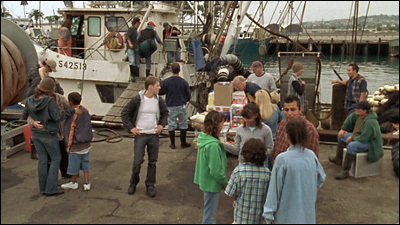 The same docks are seen again later (in the same episode) when Marissa confronts Ryan there, as he's about to leave, telling him she thinks he's a coward like her father (who also ran away on a boat). A. Real fishing boats at a real dock. A. 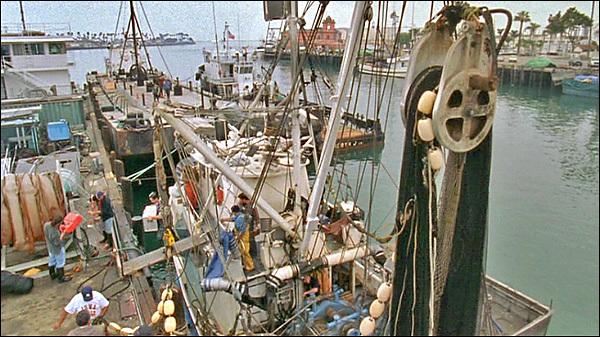 The scene was shot at the fishing docks at the south end of Ports O'Call Village, in San Pedro. 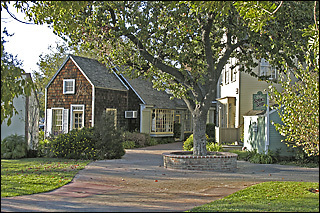 Ports O'Call Village was a popular shopping/dining/tourist spot next to the main channel of the Los Angeles harbor, the buildings constructed with a New England theme (somewhat like Fisherman's Village in Marina Del Rey). Alas, in the last decade, the village has faded, and many of its picturesque buildings have been torn down. But part of the old village remains intact (albeit with few visitors nowadays). At the far south end of the village, where the parking lot meets the water, are the old docks & piers of the San Pedro fishing fleet. The city of San Pedro was named after Saint Peter, the fisherman, and this spot used to be the scene of a major annual "Blessing of the Fleet" celebration that drew thousands to the harbor each year. The hill you see behind the boats (in the second photo down) is Palos Verdes. You can also see the Vincent Thomas Bridge (and the harbor's freight elevators) in the scenes where the camera is looking back north. The water seen is in the main channel of the Los Angeles harbor. The City of San Pedro plans to create a "Fisherman's Park" next door to the fishing docks, at the south end of Ports O'Call Village, which (while leaving the fishing fleet intact) should help beautify the industrial tip of this berth. Here is a map link to Ports O'Call. And here is an aerial photo from Live Local, with a pin marking the exact filming location. A. Ports O'Call Village used to be one of my favorite spots (before they let it deteriorate into what it is today), and when I went there, I often parked down at its south end, near the fishing boats. I also attended one of the "Blessing of the Fleet" celebrations, back when that was a major event in San Pedro. And that old, coral pink building in the background is a dead giveaway. 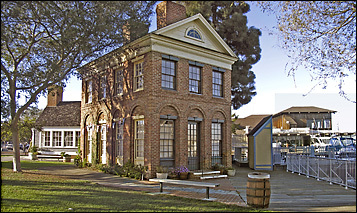 But just to be sure, I printed out a couple of screen captures, drove down to Ports O'Call and double-checked the view. It was the same, of course.